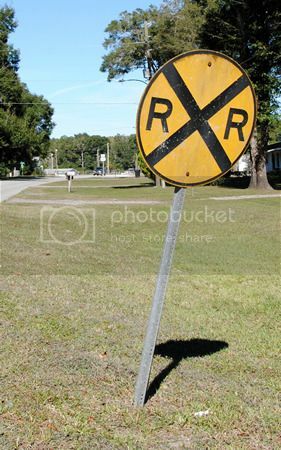 Before you read this post, you should definitely be sure you've read Part 1, as it covers some the history of the railroad in High Springs, including the layout of the remaining railroad beds and the recent removal of the tracks. 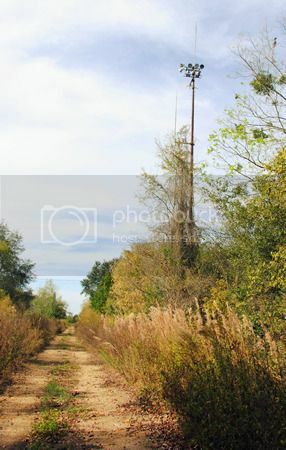 To be honest, it's also a bit more interesting of a post, as the second leg of the abandoned railroad that we traversed was not anywhere near as interesting. So seriously, if you haven't read it yet, go check it out before scrolling any further down this post. Today - again accompanied by JOM of Gravel Cyclist - I decided to check out the line going south through downtown and southeast towards the town of Alachua. 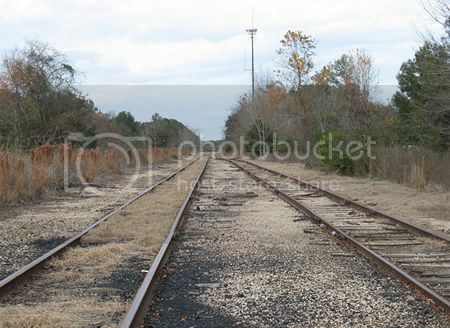 As mentioned in my previous post on this bit of rail, the tracks were pulled up at the end of February 2015. 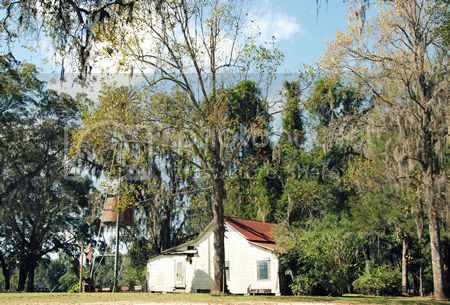 Not much evidence that High Springs was once a bustling railroad town remains. 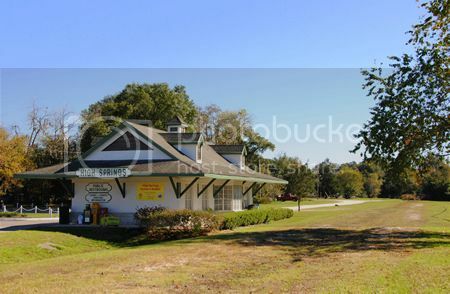 There's a welcome station / public restroom located in a faux train station located along the former rail line, just south of Main Street; most people assume it was actually the original train station. Hell, I had assumed it was the original train station. It's not. I've been told (by the folks at the High Springs Historical Museum) that it was built in the 1980s. However, just north of Main Street along NE Railroad Ave sits the original passenger depot. That's not it's original location; it used to be located several blocks north of its current location. It was moved to its current location and restored in 1994. Here's the faux train station, located along the empty railroad bed. We found the tumbledown remains of an old house. Sign at the Prime Conduit back gate, where the old siding would have been. 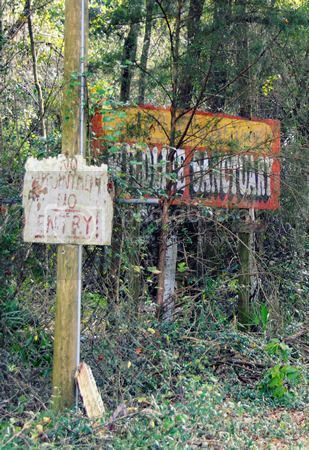 This sign, posted in 1987 according to the date on the back, still remains to warn drivers along SE 17th St that they're approaching the track, although no rails remain. 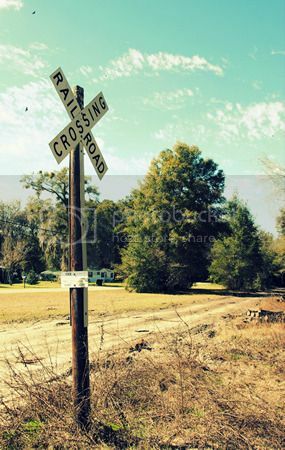 I took this picture back in February 2015 right after the rails had been removed; the railroad bed was still easily passable, and several of the crossing signs were still posted. Rivers are great and all for boating, swimming, and fishing; however, they pose an obstacle for anyone lacking either wings or a bridge. 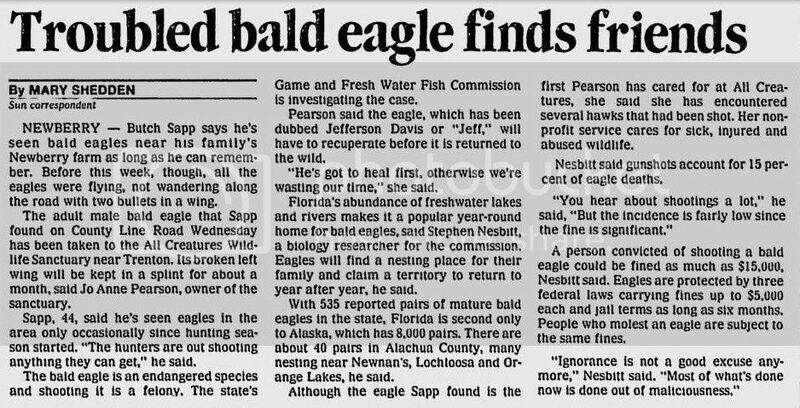 Long before European settlers came to the ‘new world,’ the native peoples of what is now Florida had to find ways to traverse the state’s many rivers. One river, however, provided an easy path. 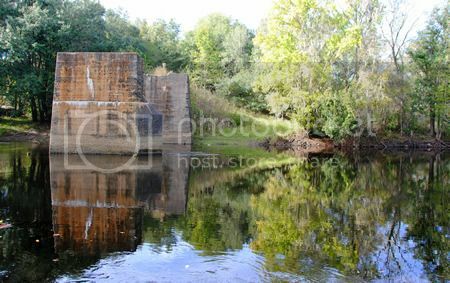 The Santa Fe River, which runs for approximately 75 miles across north Florida before merging with the larger Suwannee River, goes completely underground only to emerge from the earth three miles to the south. 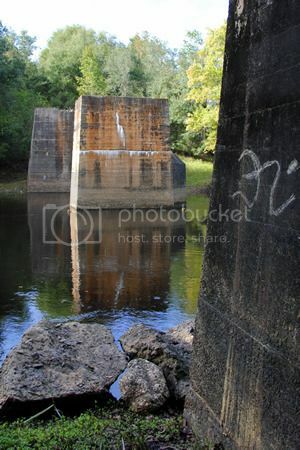 This, in effect, provided the native peoples of the state a natural bridge across an otherwise difficult to traverse waterway, and the route connecting what is now Alachua and Columbia counties became a well-trod track. After the Spanish settled the territory, they too took advantage of this natural bridge, creating a roadway of sorts linking the Spanish city of St. Augustine to what is now Pensacola. This ‘road’ crossed the natural bridge over the Santa Fe, and for a time a Spanish mission, Santa Fé de Toloca, was located there (and from whence the river received its modern name). In the 1820s, Florida became a US territory, and the new American leadership began focusing on development of the Floridian economy and infrastructure. 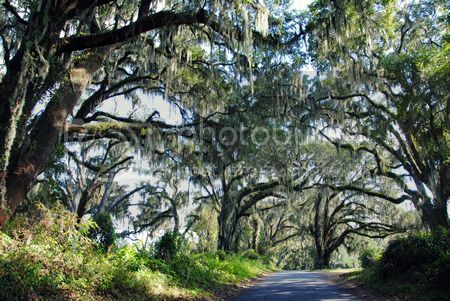 In 1824, Congress approved funding for the first federal highway in Florida: a road to be built from St. Augustine to Pensacola, following the route of the old Spanish road. 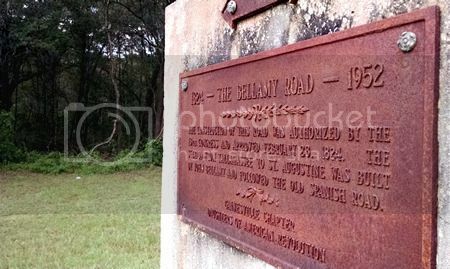 A plantation owner named John Bellamy was contracted to build the St. Augustine to Tallahassee portion, and from him that portion of the road received its name: Bellamy Road. Like its predecessor, the Bellamy Road crossed the natural bridge over the Santa Fe River. 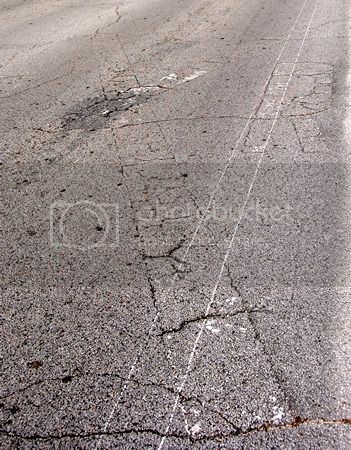 You can read a really interesting article about the construction of the road here. 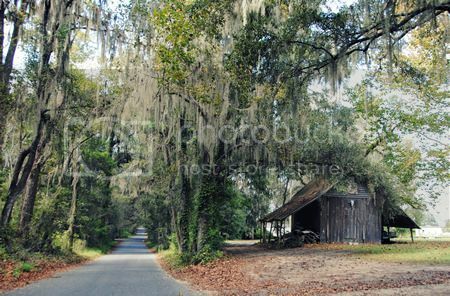 As time passed, other routes across north Florida became more popular and the Bellamy Road fell into disuse; however, stretches of the road – some paved, some dirt – still remain, scattered throughout the northeastern part of the state. 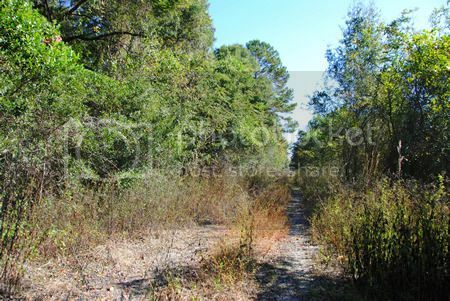 Below are some images from the sections of the road in Alachua County. 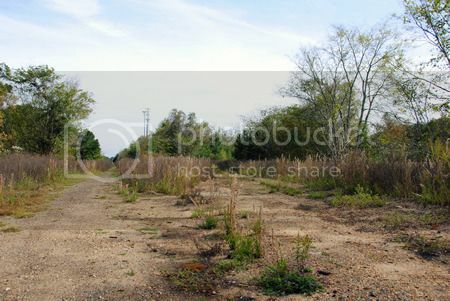 All that remains of the St. Mary's Church, an African-American church once located at the intersections of Old Providence Road and Old Bellamy Road. 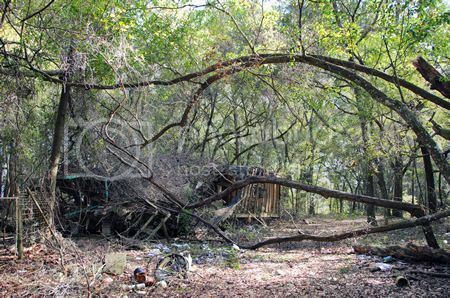 A note of caution for those interested in checking out the Old Bellamy Road, whether in Alachua or other counties: There were once numerous old structures along the roadway; however, both time and trespassers have taken their toll. The St. Mary's Church (fourth picture from the top) was one such example. 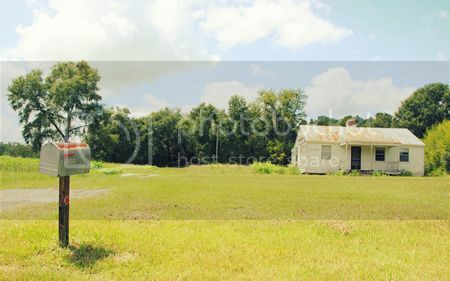 I stopped to photograph what was left of it (from the road), and the property owner was there in less than a minute. He was a very nice man, and we had a lovely chat. 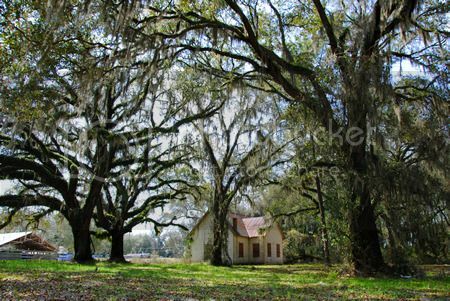 He told me that when he bought the property, the church was standing, but that over the years he caught numerous people trespassing, many of whom were taking souvenirs. He blamed such souvenir-taking on the building's eventual collapse. I photographed the final two buildings above from the roadway as well, as the properties are clearly marked as private, no trespassing. Despite not leaving the road, their owner was out to see what I was up to quite quickly as well, and seemed to be dealing with the same problem. As corny as it sounds, the quote which I've seen at numerous state and national parks, 'take nothing but pictures, leave nothing but footprints' seems achingly appropriate here. Enjoy looking at these structures, whether here online or in real life, but be respectful of the properties and their owners. 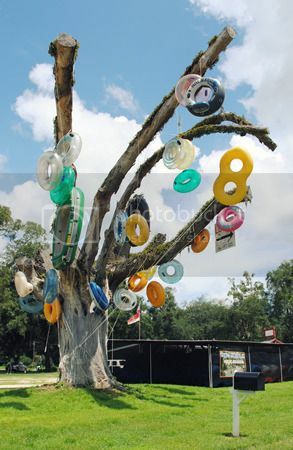 I live in High Springs, FL. It’s a small town with a population of just over 5000. Even though it’s a pretty small place, it’s a fairly active small town with popular restaurants, a local theater, an operational restored historical movie theater, antique stores, bakeries, and tons of outdoor activities revolving around the local rivers and springs. 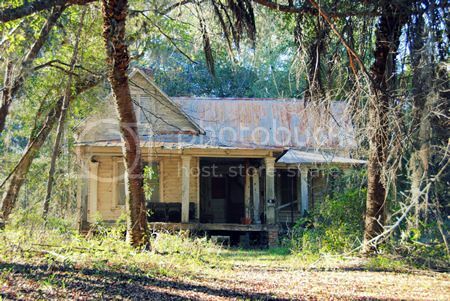 While many other small, north Florida towns of comparable size are indeed desolate, High Springs, in general, is not. 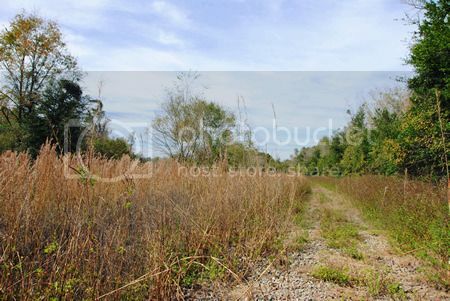 However, the one bit of desolation which High Springs does indeed have is its abandoned railroads. 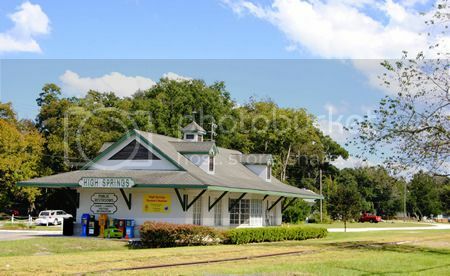 High Springs was once a fairly active railroad destination, with both a passenger and a freight railway station and a roundhouse, serving lines that ran north to south from Dupont, GA to Alachua, FL and east to west connecting High Springs to Newberry, FL and beyond. 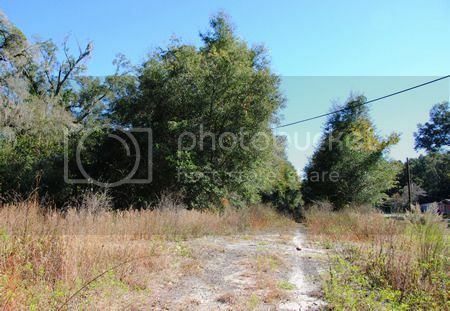 The line from Dupont to Alachua has been abandoned for many years, with the exception of a little strip here in High Springs which connected the Lamson and Sessions Prime Conduit plant just south of town along the north-south line to the connection just north of town with the east-west train line. As of 2010, the line was still active, but in desperate need of repair. 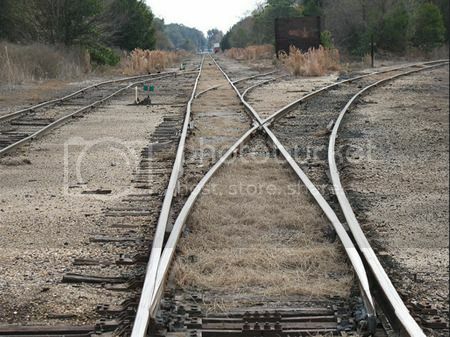 A cost/benefit analysis was conducted to determine whether the line should be repaired or abandoned, and by the following year the decision to abandon had been made. 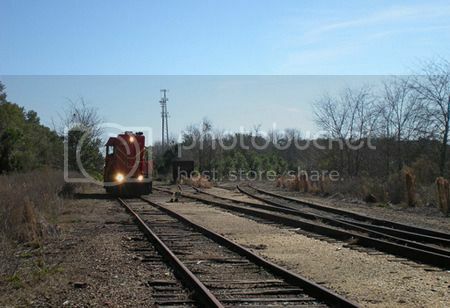 When I moved to High Springs in July 2014, the tracks were still present for the Prime Conduit to Newberry stretch of the lines, even though the rail crossings in downtown High Springs had recently been removed and the rails north of the switch had been gone for many years. In January 2015, the process of removing the rails entirely began. 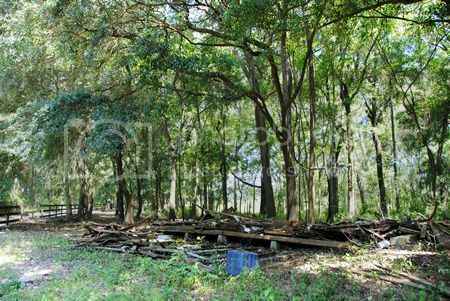 As of today, very little of the railroad remains in High Springs, aside from the train station buildings and the now empty railroad beds. I took this photo in October 2014. You can still see the tracks running past the High Springs Welcome Center located in a faux-trainstation building just south of downtown. 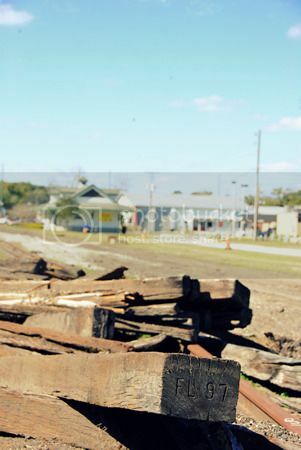 I took this on February 1, 2015, when the rails and ties had been pulled up, but hadn't yet been removed. This is where the two lines once met. Just north of the switch, we spotted a tower. As we approached the tower, we noticed a small building in the weeds and decided to check it out. 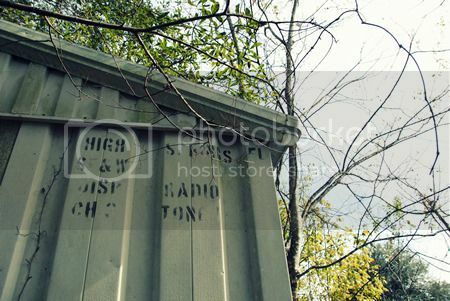 It had been a dispatch radio signal station. Now it's just an empty building. As we neared the northern end of NW 270th Ter, we did discover this little gem off to the side. From a distance I thought it looked like an outhouse. 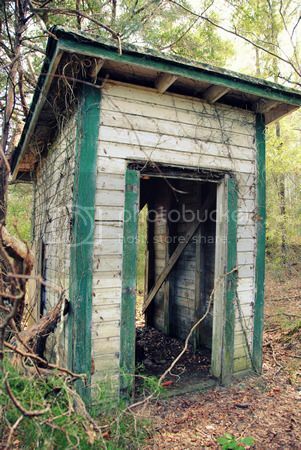 Up close... well, as far as we could tell, it had indeed been an outhouse. While there were no fixtures remaining, there were definitely pipes in the proper places for a sink and a toilet. 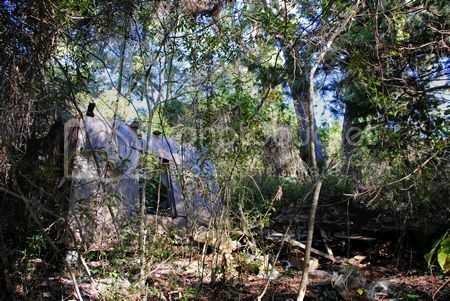 There were no signs of who this outhouse might have served, however, as there were no houses or remains thereof anywhere close. A pitstop for train engineers perhaps? 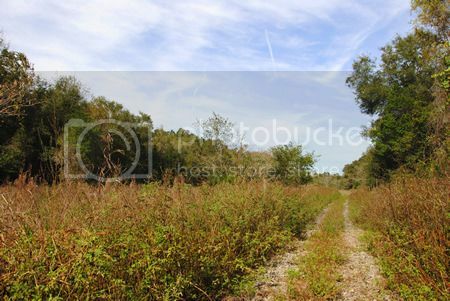 Once you cross the Santa Fe River into Columbia county, the railroad bed becomes wild and impassable. I still plan to explore the north-south line south of town, as well as the east-west line west of Poe Springs Rd, so please check back! Meanwhile, if you're into train imagery, I recommend checking out the flickr page of badge1955, where there are a ton of excellent train photos from all over. I grew up in southern Columbia County, in the area known as Columbia City (although the term ‘city’ is clearly a misnomer). 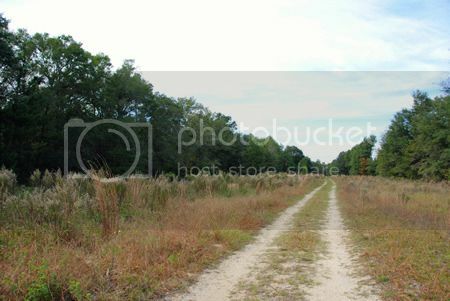 I lived on five acres at the very end of a dirt road. The nearest kid my age was a mile away, and if we needed groceries it was a 30 minute drive. 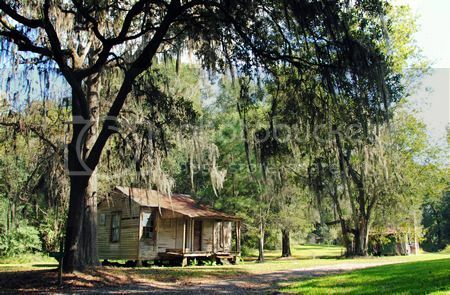 As a teenager, I wanted nothing more than to get the hell out of rural, desolate, backwoods north Florida. 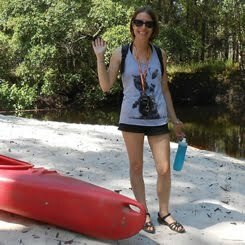 If you’d told teenage me that adult me would willingly move back to north Florida and be enjoying blogging about rural, desolate, backwoods north Florida, teenage me would have laughed in your face. However, as adult me has lived in such non-desolate locations as St. Petersburg, Russia (pop. 5 million), San Diego, CA (pop. 1.4 million), Daegu, South Korea (pop. 2.5 million), Seoul, South Korea (pop. 10 million), and Orlando, FL (pop. 2 million), living in rural north Florida in a small town with a population of 5,500 is a welcome relief. I have once again been living in north Florida for the past year and a half, and I love it. 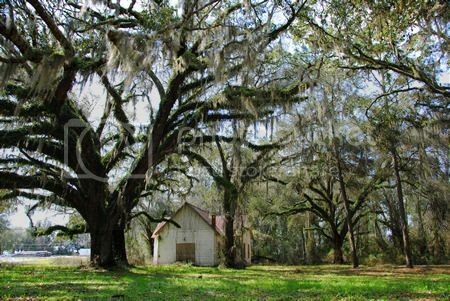 I’ve taken several drives through Columbia County to look at my old haunts and (of course) take some photos. Given my close proximity to Columbia County (I can make it there in about five minutes or so by car), I expect to share quite a few images from that county with you. 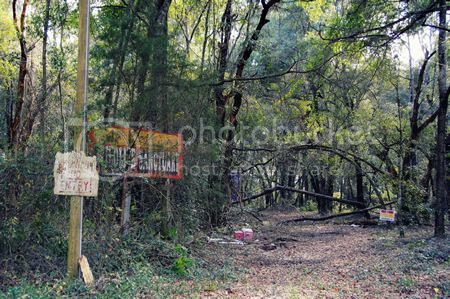 Here are some of the more recent ones I’ve taken of the area around various spots in southern Columbia County, including in Columbia "city." Ichetucknee River from Ichetucknee Springs. In the off season, however, it is quite desolate. The dirt road that I grew up at the end of is now paved. 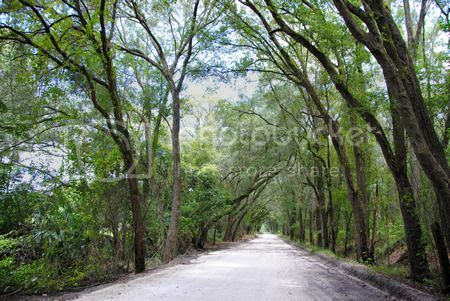 This one, leading into Columbia City, remains a beautiful tree-lined dirt road. If you take highway 240 east from Columbia City, you will eventually come to the intersection with 441, at another booming metropolis known as Watermelon Park. There's not much there, desolate or not... other than Nettles Sausage and a boarded up old building that was apparently once a church. It's been boarded up like that as long as I can remember. 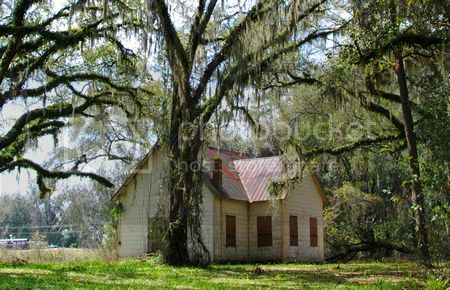 I don't know what kind of church it was or when it shut down, although other Columbia County folk (again from the local facebook group) have confirmed that it was indeed once a church. Several of them mentioned that it was actually moved to its present location, although I don't have any details on when that happened or where it was located originally. 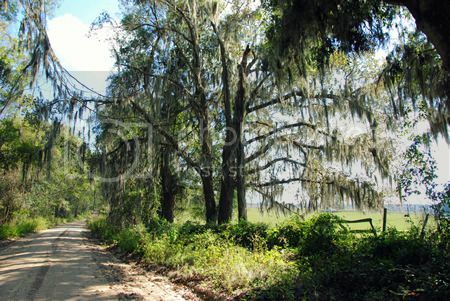 To the southeast of Watermelon Park, there are a large number of roads named after various members of the Feagle family, an old Columbia County family. 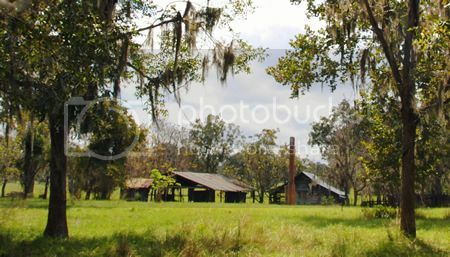 At the end of one dirt road sits the remains of the old Feagle homestead. There's not much left of it. 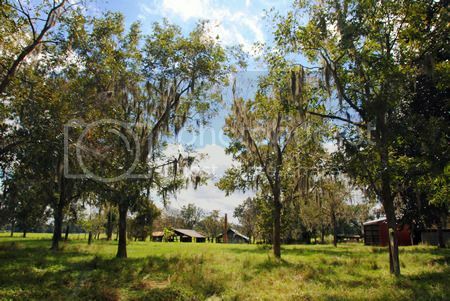 If you head further south, heading back towards Alachua county, there's another gem located at the end of another dirt road. 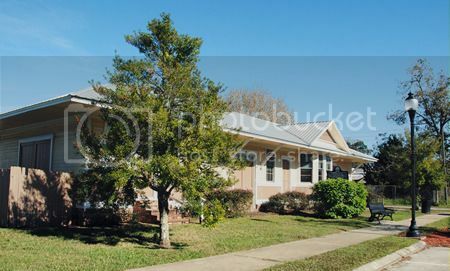 It sits empty on a property, the owners of which appear to live in a much newer home on the same plat. I would love to have this house. 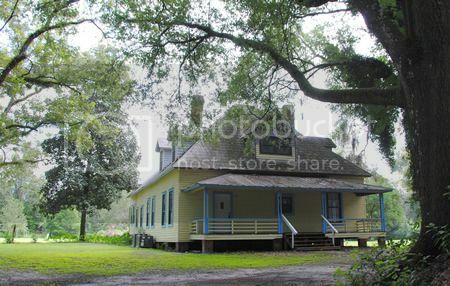 As my mom had an old house moved onto her property and restored, I can totally see myself doing that one day. 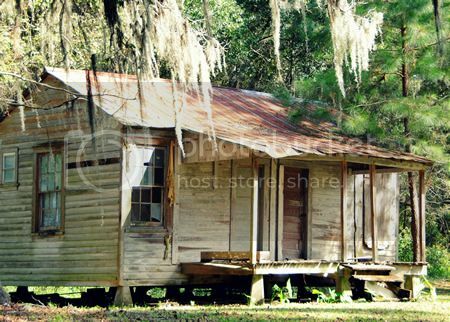 I'd love to move this house to my property.... if only it were available. And if only I had property, haha. I am drawn to desolation because I find beauty in the desolate and the decaying, but I am also drawn to the mysteries surrounding things which have been abandoned. Something inside me wants not only to explore and to photograph, but to find out what various abandoned places once were and how they arrived at their current state. Often, despite the numerous sources that are available, one can only find out so much, and the remaining mystery continues to tantalize and draw one in. 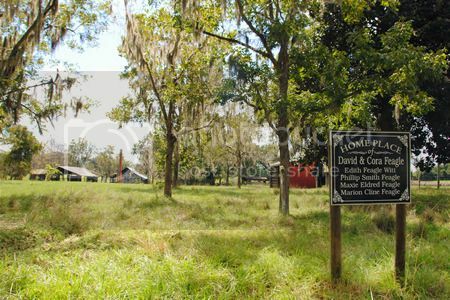 My previous post about Asberry Cemetery was one such tantalizing mystery. This post is another. 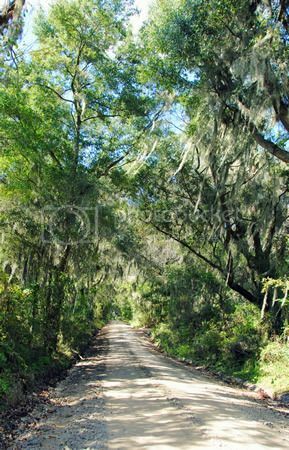 I spent the other day exploring various dirt roads of north Florida, which is one of my favorite hobbies. I drove far down a narrow dirt road in an incredibly rural county, and had actually worried that the road might be blocked by a gate at some point. 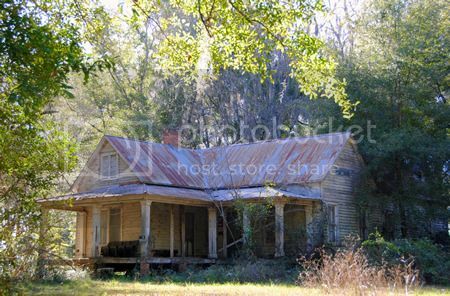 While I had been hoping to find something to photograph, I had expected something along the lines of an old farmhouse, however what I found was quite different. I was driving along, enjoying the view of woodland on my right and vast fields dotted with hay bales on my left, when out of the corner of my eye I thought I spotted something. I hit the brakes and threw my car into reverse, and there it was. 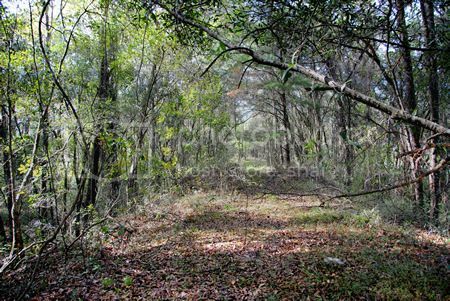 It was an overgrown road or driveway leading into the woods, and there were faded signs – including a large, faded billboard. This had clearly once been something. We parked the car and got out. The faded billboard read All Creatures Wildlife Sanctuary. Another, even more faded and barely readable sign read No Hunting! No Entry! 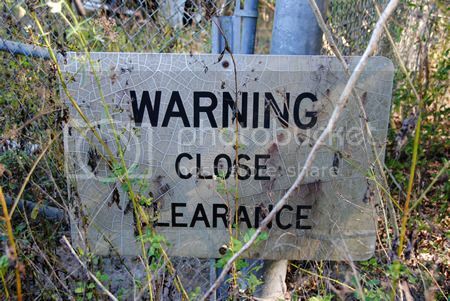 We didn’t wish to trespass, but as it was clear that as neither the signs nor the facility itself had had any recent use, we ventured a short way down the overgrown drive. There wasn’t much to see, really, and it wasn’t exactly what you’d call picturesque. It was, however, both desolate and sad. 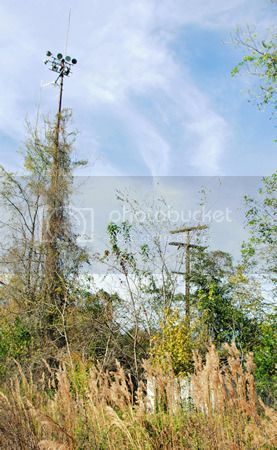 All that remained of the All Creatures Animal Rescue, aside from the faded and broken signage, were some bent and mangled remains of fences, and the collapsed and stripped remains of a building of some kind. As an animal lover, and as someone who has done a lot of animal rescue work in her life (albeit with domestic animals, not wildlife), this place really got to me. If it had indeed been a fully functioning wildlife sanctuary, providing homes to ‘all creatures’ as it were, the fact that it was now little more than a few broken signs and a collapsing pile of rubble was incredibly depressing. What had happened here? 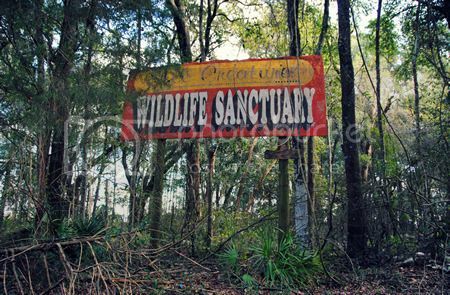 Had it really been a wildlife sanctuary? Why had it closed? Where had all the animals gone? I thought for sure that the internet would have all the answers to my questions; however, as with Asberry Cemetery, there was only so much that I could discover. All Creatures Wildlife Sanctuary was active as a registered non-profit from 1987 to 2004. This was the most comprehensive article I was able to on the facility. 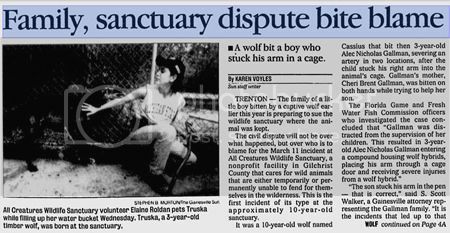 According to the article, the facility was home to a wide variety of wild animals, including wolves, cougars, bobcats, owls, hawks, deer, tortoises, and more. 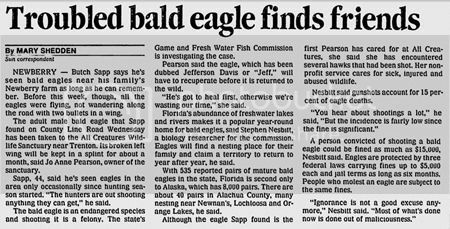 They were federally licensed to take care for wild animals: those that had been injured and needed rehabilitation (see the article on the rescued bald eagle below), those with permanent injuries or disabilities which would have prevented them from surviving on their own in the wild, and those confiscated from unlicensed owners which had become too 'domesticated' to be released into the wild. Wild animals with shrinking populations were bred at the facility, and zoos from across the country liaised with All Creatures Wildlife Sanctuary to arrange breeding of rare animals. The facility itself ran on volunteer labor and donations. Tours of the facility were by appointment only, and cost $5 per person. Additionally, people seeking to earn their license to work with exotic wildlife, could put in their required 1000 hours of training at the facility. 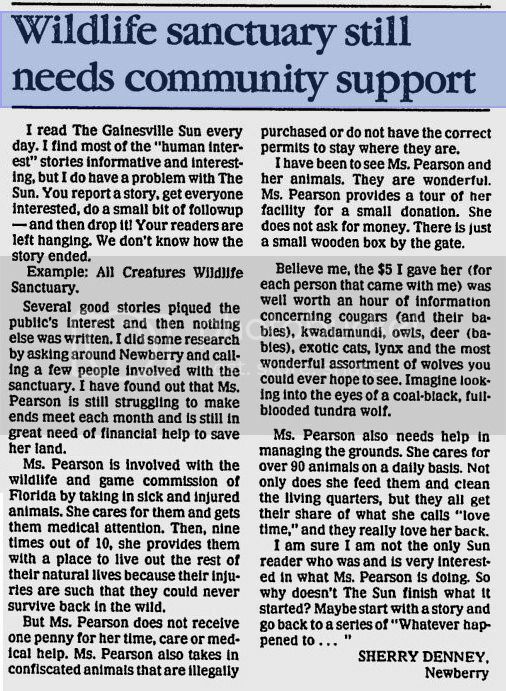 According to these articles, the sanctuary lent its male bobcat (which they used for breeding purposes) to Homosassa Springs Wildlife Park in 1990. 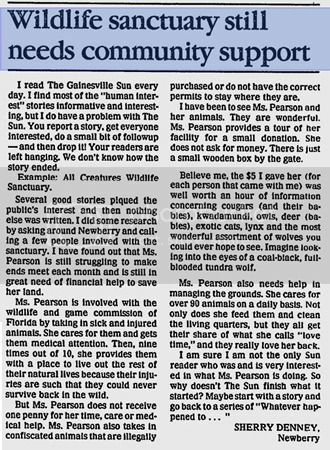 The Homosassa Springs Wildlife Park then had him neutered, in what seems to have been some sort of misunderstanding about whether the bobcat was a loan or a gift, which you can read about HERE. However, what I am assuming (and this is just an assumption) was the death knell for the organization occurred in March 1998. A volunteer brought her children with her when she came to the facility. She left her children unsupervised, and one of them - a three year old boy - stuck his arm into a cage with a wolf, which then proceeded to maul the boy's arm. This incident led to fines levied against the facility for negligence, a federal investigation into safety at the facility, and threats of a lawsuit by the boy's family. And that's it. That's where the story runs cold, at least so far as I could find. The last recorded date of activity at least in the organization's name was 2004. 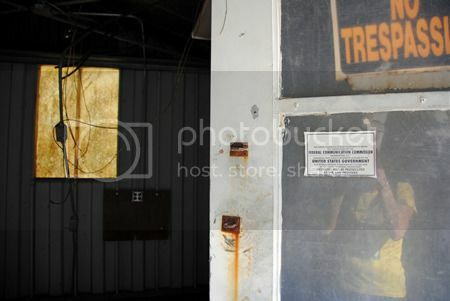 The property itself was sold in 2005 and again in 2006, and it has sat vacant ever since. What happened to force the sanctuary to close? Where did the animals go? I still do not know.